With Halloween fast approaching and pumpkin heads, zombie masks and – most scarily – posters of the pop band ‘One Direction’ in nearly every store window, I thought I’d take the opportunity to tell you about my favourite horror movie subject, an archetype that never failed to terrify me when I was a child, and a theme that continues to fascinate, thrill and sometimes appall me as I creak and grumble through… well, let’s just say I’m getting older. I love movies about witches: Dario Argento’s ‘Suspiria’ (1977) is a terrific witchcraft film, slightly let down by its ‘sequel’ ‘Inferno’ (1980) and then totally trashed by the final part of the trilogy ‘Mother of Tears’ (2007) which I used to hate but now guiltily enjoy because it’s so ludicrous. I even love non-horror movies about witches: ‘Bell Book and Candle’ (1958) has always been high on my list of favourites, not least because it re-teamed James Stewart and Kim Novak (yes, I’m one of those people who thinks ‘Vertigo’ could possibly be the greatest film ever made) and 1942’s ‘I Married A Witch’ with Frederic March and Veronica Lake is always worth checking out on a rainy Sunday afternoon. ‘Practical Magic’ (1998) is also pretty special too, in a romcommy witchcraft way, and it’s based on a superb Alice Hoffman novel. But, as far as I’m concerned, the halcyon days of motion picture witches began somewhere around the late 1950s and ended in the mid 1970s, and British studios were responsible for practically all of them. 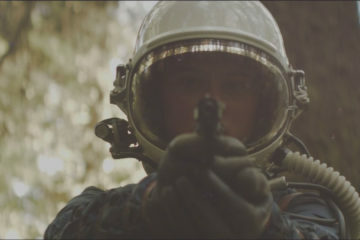 British film producers understood that what makes the witchcraft theme work so well is the inherent threat of invisible forces circulating around us that we don’t understand, which can be manipulated and used to destroy us if we get on the wrong side of the witch or the warlock who lives down the street. And anyone could be a witch or a warlock, particularly the people we’d never expect. They don’t have a cape and fangs, or bolts in their neck, or stagger blindly with arms outstretched pleading for “Brains”. 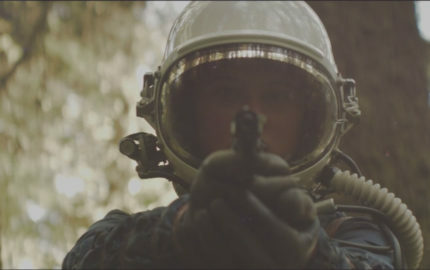 They’re not dispatched by silver bullets or sunlight. And the powers they possess are as ancient as time, as insidious and inescapable as the dark side of nature, and always potentially soul-as-well-as-life destroying. Which isn’t to say there aren’t some good witches too. You’ll find both types of witch in Sidney Hayers remarkable 1962 thriller ‘Night of the Eagle’ (US title: ‘Burn Witch Burn’) which was an extremely faithful adaptation – by Richard Matheson and Charles Beaumont – of Fritz Leiber’s equally remarkable novel ‘Conjure Wife’. The story centres around college professor Norman Taylor (Peter Wyngarde) who is a staunch non-believer in witchcraft and doesn’t realise some very nasty spells have been cast against him to ruin his career, spells that his wife Tansy (Janet Blair) has secretly rendered ineffective by surrounding him with her own charms of protection. When Norman discovers what Tansy’s been doing he makes her throw the charms away, and very quickly comes to regret it. 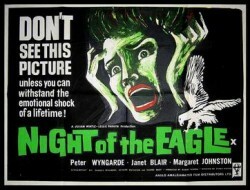 ‘Night of the Eagle’ is my favourite example of British witchcraft-horror. 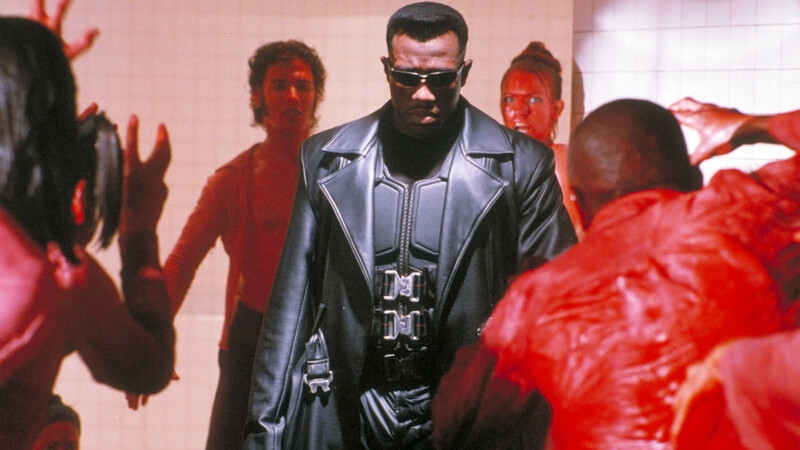 It’s tightly constructed, beautifully directed and performed, and treats its subject and its viewers seriously, piling on the atmosphere, avoiding histrionics, and making the threat of urban modern-world black magic something real and visceral. It also avoids the witchcraft cliches. There are no brooms and pointy hats or burnings at the stake (as usual for the 1960s, the US’s title change and lurid poster art was shiveringly eye-catching but completely misled audiences) and there’s a psychological depth to the characters and Norman Taylor’s predicament which adds a chilling layer of authenticity to the proceedings. In short, if you’re as crazy about witches as I am, it’s the perfect opener to a night of Halloween cinema. 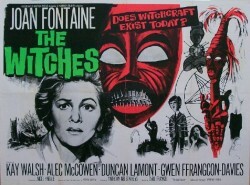 In 1966, Hammer weighed into the subject with the imaginatively titled ‘The Witches’, the story of schoolteacher Gwen Mayfield (Joan Fontaine) who has a nasty run-in with black magic while teaching in Africa, and then discovers there’s some even nastier black magic taking place in the small English village she retreats to to recover from her horrific African experience. As far as I’m concerned, ‘The Witches’ is Hammer’s most underrated film. By the mid-1960s the little studio in Bray had become a production line for low-budget, entertaining but insubstantially written and directed gothic potboilers, and ‘The Witches’ (alongside ‘Plague of the Zombies’ and ‘The Reptile’, both made the same year) was proof they could still make something fabulous given the right material (in ‘The Witches ‘ case, that was a screenplay by Nigel Kneale based on a novel by Norah Lofts). Like ‘Night of the Eagle’, ‘The Witches’ makes modern-day black magic a believably terrifying threat, made all the more unsettling by its quaint English village locale and the gently sinister ultra-polite facade of the very ordinary-looking people who live there, most of whom (may be) in on the dark satanic secret Gwen Mayfield is on a collision course to discover. For a Halloween double-bill, ‘The Witches’ and ‘Night of the Eagle’ make a perfect pairing. And then, hop-scotching back a few years to 1960, comes ‘City of the Dead’, which didn’t get any favours in the US when the American distributors renamed it ‘Horror Hotel’. If you’re a fan of witch burning you’ll enjoy the opening scene when Elizabeth Selwyn (Patricia Jessel) is executed at the stake, but not before cursing the inhabitants of the small New England town of Whitewood where – slamming forwards to the present-day – pretty young coed Nan Barlow (Venetia Stevenson) journeys to Whitewood (after encouragement from her college professor Christopher Lee, which can’t be a good thing) to research a paper on witchcraft, not realising that she’s en route to get some very hands-on (actually, sacrificial blade-in) experience. Yes, it’s another witchcraft story set in the modern-day but director John Llewellyn Moxey and writer George Baxt (from a story by Milton Subotsky) set out their stall right at the beginning with their flashback to Elizabeth Selwyn’s fiery demise, which gives the film a very dreamlike ‘caught between two dimensions’ feel, a sensation that is further enhanced by some wonderful black and white photography, making Whitewood the perfect place to experience a beautiful mist-shrouded nightmare. 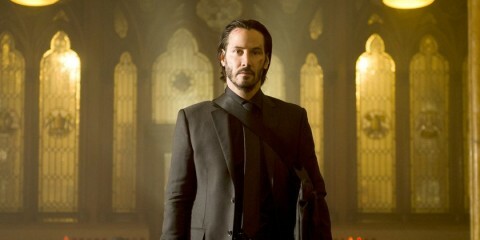 Of course, we all know that witchcraft can come in various forms. 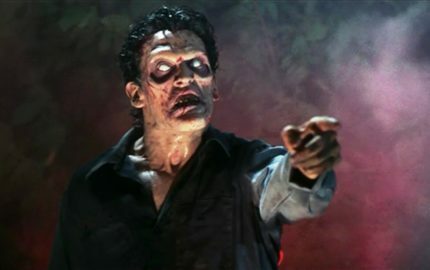 You could argue that voodoo is a form of witchcraft, and Hammer’s aforementioned ‘Plague of the Zombies’ handles that offshoot exceptionally well (so does Wes Craven’s criminally overlooked ‘The Serpent and the Rainbow’ (1988) although, since this is a piece about British horror, I’ll probably talk about that another time). Another form of witchcraft is employed in Jacques Tourneur’s ‘Night of the Demon’, an atmospheric and beautifully realised British horror film produced in 1957, which was not only shortened for release in the US but, you’ve guessed it, retitled as well. Stateside, it’s called ‘Curse of the Demon’. 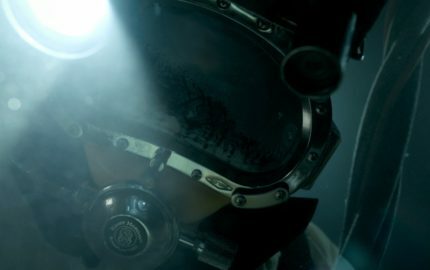 Try to watch the original version first, but – whichever version you can get hold of – don’t miss it. 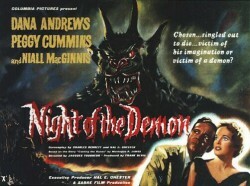 Like most of my earlier mentions, ‘Night of the Demon’ was derived from an extremely effective short story by MR James, eloquently updated to the modern day and then expertly expanded upon by screenwriters Charles Bennett and Hal E. Chester. For completists, MR James source story is entitled ‘Casting the Runes’ and it’s well worth a read. The wonderful British screenwriter Clive Exton also adapted the story for British TV back in 1979 and although that version was badly hampered by a miniscule television budget, it’s equally well worth tracking down. But let’s get back to ‘Night of the Demon’. After a man dies in mysterious and messy occult circumstances, parapsychologist John Holden (Dana Andrews) decides to investigate and finds his life and sanity threatened by the charmingly malevolent black magician Julian Karswell (Niall MacGinnis) who suggests that if Holden continues his investigations he might well meet with the earlier victims fate. 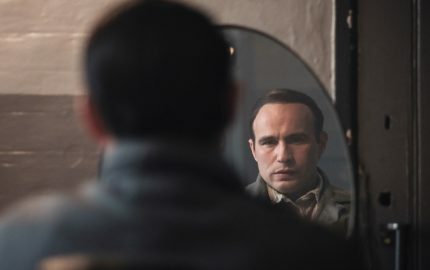 Of course, Holden doesn’t scare easily (it would be a very short movie if he did) but whether or not he manages to avoid the curse Karswell places upon him racks up the tension and keeps us guessing right up until the final moments. I should probably mention that both ‘Night of the Demon’ and ‘Night of the Eagle’ are – in a very small, don’t-even-worry-about-it way – hampered at their climaxes by some pretty hokey special effects. 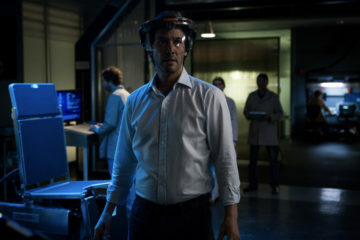 As I understand it, in both cases the need for the effects was imposed by the studio heads and vehemently disputed by those movies’ creative teams, but money talks right? Having said that, they are only tiny blemishes on wonderfully crafted and psychologically true examples of ingenious horror storytelling, so be prepared for an ‘I don’t believe they did that’ moment but be reassured you’ll still love the films anyway. And there you have it, ‘Night of the Eagle,, ‘The Witches’, ‘City of the Dead’ and ‘Night of the Demon’ aka the perfect Halloween movie all-nighter. 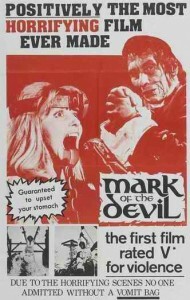 And if you really want to watch British witches until All Hallows Eve is just a distant memory, don’t forget the curious but wonderful ‘Blood on Satan’s Claw’ (1971) Michael Armstrong’s flawed but still squirmily enjoyable ‘Mark of the Devil’ (1970) and, for a completely different but fascinating take on the theme of what being lured by the possibility of magic can do to the mind, check out the rarely seen Michael Caine starrer ‘The Magus’ (1968, based on the John Fowles novel). Don’t even get me started on 1968’s ‘Witchfinder General’, which you should definitely see before you watch ‘Mark of the Devil’, ‘The Wicker Man’ (1973) which is about to be released on blu-ray in its supposedly definitive Final Cut (avoid the Neil LaBute ‘reboot(ed the original in the head’ at all costs, and if you’re a fan of ‘The Wicker Man’ and really need to watch Robin Hardy’s follow-up ‘The Wicker Tree’ prepare to throw something at the screen) and Ken Russell’s ‘The Devils’ (1971) which is as overblown and operatic as any Russell devotee would expect but, beneath its gaudy surface, has a lot to say about the historical truth of witch hysteria and the sickening depravity and real-life persecution inflicted on the innocent women, and sometimes men, who were rendered its victims. And then, of course, there’s Mario Bava’s mesmeric ‘Black Sunday’, easily my favourite of Bava’s canon, which would have been at least Number Three on my Halloween list if it had been a British movie. In a way, thanks to Barbara Steele’s luscious performance as both villain and victim, it kind of is. And the new Arrow blu ray looks phenomenal.